As Opower's first content strategist, I led the effort to bring a consistent voice to our products. To start, I reviewed what we were currently sending out. What I found was a range of writing styles: highly technical to overly casual and everything in between. This unnecessary variation muddled up Opower's message and slowed down the design process, since each designer had to make things up as they went along. Opower creates communications for 80+ utilities around the world. In essence, it's a white label product. One of the interesting things about this business model is that products need to be customized for each utility. In light of this, a distinctive voice with a lot of personality would be hard to maintain. Also, let's be real: Utilities tend to be pretty stodgy. A highly unique voice wouldn't feel appropriate in context of other utility communications. I also created a content style guide to answer more detailed questions about punctuation, grammar, etc. It's been great to see designers and product managers reference the style guide. By documenting a "house style", no one needs to waste time debating capitalization. Defining styles takes some effort up front, but it makes things much more efficient! Define a consistent writing style for the Opattern (Opower's design system). 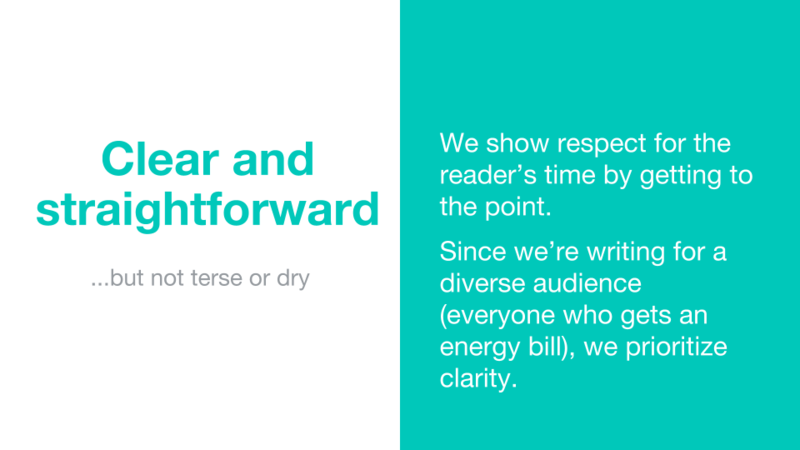 Clarify what voice to use—and make sure it's appropriate for everyone who gets a utility bill.